Cats and mischief usually go hand in hand. 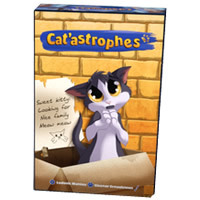 This is the premises of the game Cat'astrophes: trying to do as much mischief as possible without getting caught and try backstabbing others! Whether you're a cat lover or a mischief maker, this game is for you. Cat'astrophes is a great cat themed game that gets everyone in on the fun. Easy to learn and quick to play with most games finishing under 15 minutes. This one-of-a-kind game will be the next hit at your next game night. Be sure to learn more below and let us know if you've ever played Cat'astrophes. Buy your copy of Cat'astrophes today! The player with the lowest punishment score as shown by the score tracker wins. You will get 6 individual cat cards, 6 colored cubes, playing cards, 1 mischief scale (board), 1 first-player token, 1 mischief token, 1 score tracker and the official Cat'astrophes game rules and instructions. Please keep in mind that the official Cat'astrophes dice-card rules and instructions could be different depending on the game version you have. The rules below are some of the exact directions on how to play Cat'astrophes. Share with us your comments, funny stories, tips, advice, strategies, creative ways to play, questions about how to play, problems with the rules or anything you want about Cat'astrophes. All submissions will be reviewed within 24 hours. Click here to add your Cat'astrophes comments.